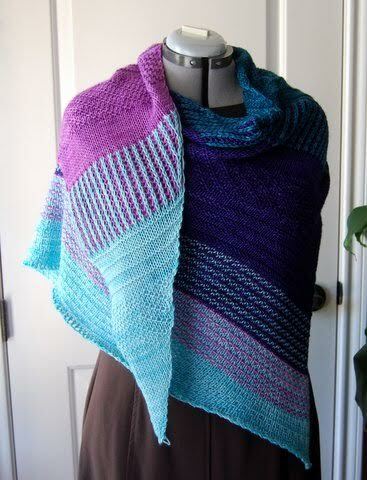 Yarns: Baah Shasta in Maldives (light blue) and Lilac, as well as Malabrigo Rios in Teal Feather and Purple Mystery. And, YES, blocking makes a world of difference. The instructions said to block gently and mine came out to the recommended 72" in length. 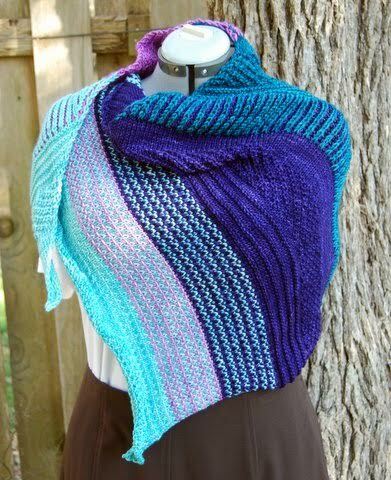 Also, while I followed the pattern scrupulously through the first fourteen sections, at section fifteen, I followed the stitch pattern, but went rogue and mixed the colors up because I wanted to see more of the Maldives color, especially next to the Purple Mystery. The pattern is very well written, particularly for the brioche sections. If you have not tried brioche, I enthusiastically recommend it! 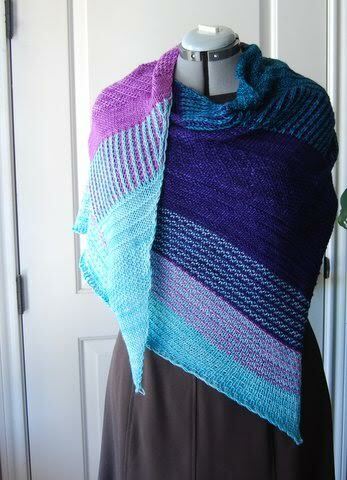 Above is the pre-blocked shawl. Again, what a huge difference blocking makes. Lastly, here it hangs on a six foot privacy fence. If you are looking for a fun and fast, stash-busting knit, I wholly recommend Range Shawl! Now, the big question looming for the remainder of the day is: Do I knit or do I weave?